We, Salem Steel is stockiest of Aluminium Raw Material, which are used in various industrial applications. Constructed from premium grade raw materials, our range of rods are known for high-strength, excellent finish and longer life. Our Aluminum round bars are offered in various specifications of sizes.Available in : Alloy 7075/2014/6082/6061/6063. We are authorised distributor of Hindalco Industries Ltd in india. We sale this material in all over india. We deal in Aluminium sheet, coils , chequired sheet , roofing sheet , alloy sheet and coils and many more products. Please fill free to contact us. 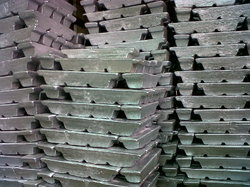 Our organization has gained immense recognition in offering a quality tested range of Aluminum Raw Material.